We went to a bridal expo this winter and one of the booths was giving out coasters from Weddingstar. 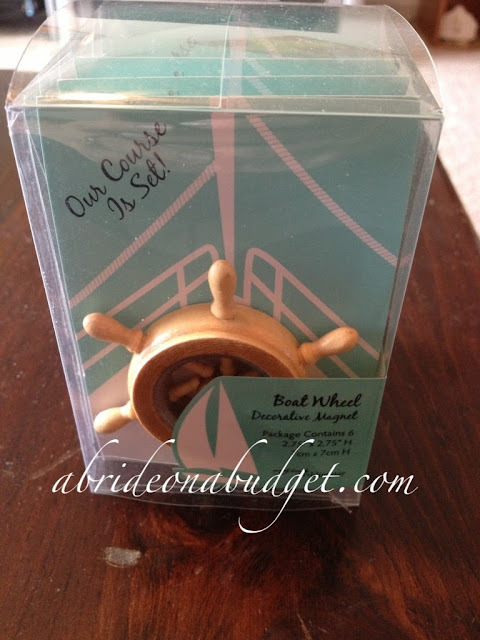 I loved them, so when I got the chance to check out boat wheel magnet favors from Beau-coup (made by Weddingstar), I was really excited. It looks like someone forgot to stain my set of six. I'm going to be perfectly honest: For the sake of the review, I didn't really care that they were lighter than expected (Side note: Beau Coup has updated the photo of these to reflect a lighter stain. Originally, it was a dark stain shown in the top photo). I'm just going to hang these on our fridge anyway. 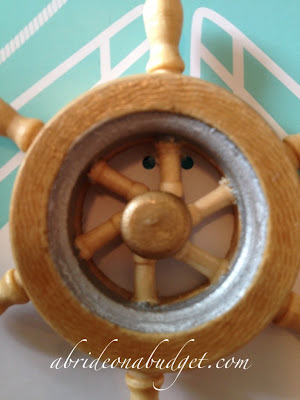 But, if I was a bride and I ordered this nautical boat wheel magnet favor, expecting it to arrive a dark maple and it arrived a light color, I would be upset. I just know how I am, with a year to go. I'm so stressed out, so high strung, flipping out over every minor thing. So the wrong stain would crumble me. I read online that there was "some assembly required" with these, and I couldn't understand what that would be. Turns out, it is very, very minor. 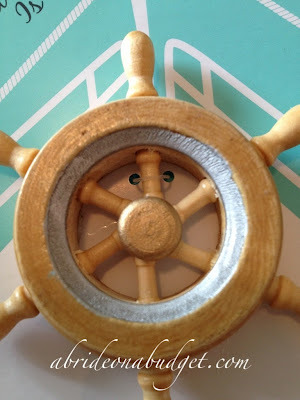 The boat wheel magnet is attached to a piece of cardboard, affixed with a small piece of fishing wire. On the back of the cardboard is an anchor. The "assembly" is to fold the anchor in a pre-determined location to pop it out so the magnet can stand. Plus, it's a nice way to stand these at each place setting instead of just lying it flat on a plate. Since you can see both sides at the same time above, it's a good time to note that there is quite a bit of detail on the cardboard. The front has an outline of a boat and the back is adorned with a drawing of a rope. It's really cute. These would definitely be great if you're planning a reception on a boat (something that they actually do where I live) or just for a destination wedding. These would not be great if you're a perfectionist or if you flip out over things. 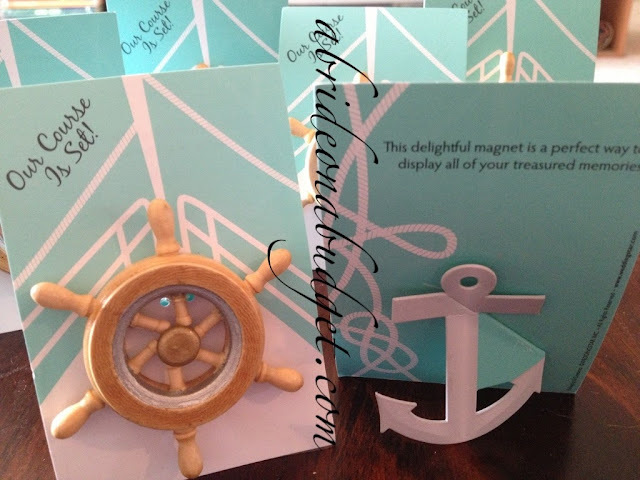 The two photos of the boat wheel magnet favor above are from two of the six favors in the set. If you notice, the top post isn't perfectly aligned. It's a bit, well, off. Again for me, I didn't care. No one is going to come to my fridge and examine the posts. But, for a bride to be who stresses over every detail, you might want to pick a wedding favor with less construction, like coasters, bottle openers, wine stoppers, etc. Beau-coup does sell a ton of favors, so you'll be able to find the perfect favor for you. BRIDAL BABBLE: Would the minor differences if you bought these? 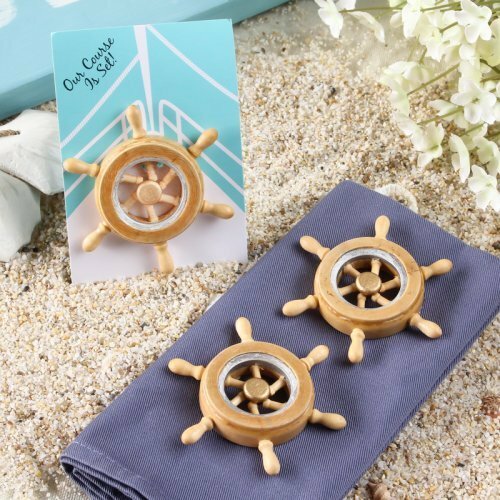 Need these for a nautical wedding? 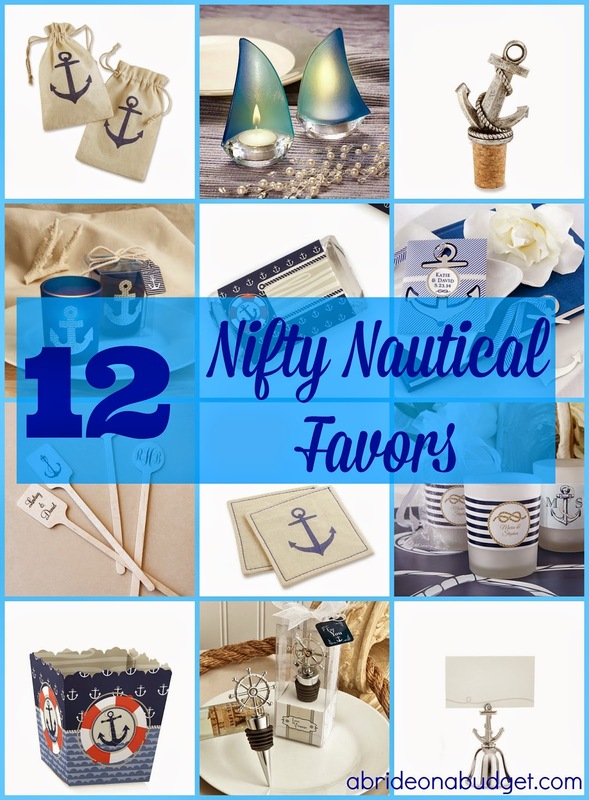 Check out our Nifty Nautical Wedding Favors post. I could tell from the first picture I couldn't handle it if I got those for my wedding. I am OCD when it comes to things being lined up and the fact that the posts weren't perfectly straight I would go bananas. When I see these I don't picture wedding. I don't know, I just don't see these as wedding decor at all. It's worse that you describe - just from your photos above, you can see that every one of the interior posts is misaligned. If you look at "their" photo, every post (interior and exterior) is perfectly aligned and straight. In your photos, EVERY post is misaligned and crooked. Ship helms don't have a spiral design on the interior - they're straight and geometric. I'm glad I saw this post of yours - I was excited about these favors, but now I realize that they are not worthy of a wedding favor. Thank you!